After being entirely preoccupied with unexpected changes and fully loaded agenda these past few weeks, I had to take a moment to remember the last time I had an extended 8+ hours of rest. This weekend was the perfect reminder of how much of a treat it is ... nestled comfortably under the duvet, and being able to cancel out all unnecessary noise without earphones. Yes, it was heavenly! I hope you had a wonderful Easter/Passover. I was able to enjoy the company of close friends and their little ones all smiling from ear to ear as they opened pastel coloured gifts. Then, later we took time to visit my sister to have an early Thai dinner. Since spring has arrived I've wanted to bring out my bright handbags, including this tangerine studded clutch! Wearing bold colours are my absolute favourite, but with this outfit I decided to let the rich colours in my scarf be enough of an accent with the clutch and added darker layers. I wore this outfit to attend a film night with friends, which is always fun! We watched Amour and Life of Pi. Have you seen any of those films? The goods: Clutch-c/o Oasap, Blazer-Zara, Riding boots-Banana Republic, Eyeglasses frames-Firmoo, Denim-Express, Graphic Tee-Art Festival, Cardigan-H&M, Scarf-Thrifted. These tangerine flashes are spicing up the whole outfit!! Happy easter!!! I love and WANT your clutch. have a fantastic Monday, dear Madison. Nice! I want a clutch like this but in a neon colour, its great. Love the pop of orange of your bag! oh I love those orange accents! every time I see something orange (=pretty) in blogs it makes me smile. in fact I think I should wear something orange soon. I haven't seen those films btw. cinema is a very rare location for me and my fiance since our taste in films is extra picky, hehe. This is what i call ''Chickitodiva'' you look stunning!!! your colors are brilliant, great details. Loving your clutch bag and scarf. kisses..
Great clutch and scarf. I'm welcoming Spring big-time. Beautiful look, I love both films and I like Amour so much! Glad to hear you finally got some well-earned rest, Madison, and that you had a lovely Easter/ Passover weekend. I totally want to see Life of Pi, but just haven't had the chance to! I really like that teal cardi! It's so cute. I really need to watch those movies. I've heard they were superb! You had a great weekend! I bet the Thai food was good :D Love your clutch! It's a beautiful color! Looks great with your outfit! Enter to win a piece of jewelry from StyleGodis! Love the pops of tangerine! You look super cute in your glasses. Very elegan and classy :) I really like this bag! I like the studded clutch with the scarf. I have a new tangerine bag that I can't wait to break out for spring. Yes, really loved Amour as well. I saw it before, but then again with other friends. Thank you Adeola! Loving this color combo - so cute! Teal and tangerine - what a combination! This is a great smart casual look with the blazer smartening up the jeasn. I love that clutch! I watchet Life of Pi. What an incredible story! I adore this look! great clutch! this is a great color mix, and I adore the studded detailing on the clutch! Happy Easter, Madison! I'm glad to hear you were able to take some time out from your busy schedule to relax and enjoy time with family :) And you looked lovely for the occasion, this pairing of teal and tangerine is unexpected but really lovely! Glad your weekend was a good one. And cheers to 8+ hours of sleep a night...it's been ages since I've had that. My family came up to celebrate Easter at our house...was quite the perfect weekend as well, despite the busy couple weeks I've had. This colour combination is so amazing. Love the style of the cardigan. I haven't seen life of pi but I read the book and I have only heard goods things about it from those who have seen it. I love how the teal and tangerine colors look together. So chic, you look beautiful! Thanks Marisa! I'm sure this colour combo will look amazing on you! :-) Thank you so much Cee! Glad you had a fun Easter! It's always more fun when there are kids around. I was surrounded by my nieces and nephews that day, we did an egg hunt and everything! love the color combo- and always impress with the elements you add to make the outfit yours! such a cool clutch! love the pretty color and the rockin' studs! it's the perfect accent to your outfit. You look great! I am loving your outfit especially that top and your clutch. Love this outfit and you look so amazing in those glasses!!! Beautiful mix of color! I just love that amazing clutch! Glad to hear you got some rest this weekend! 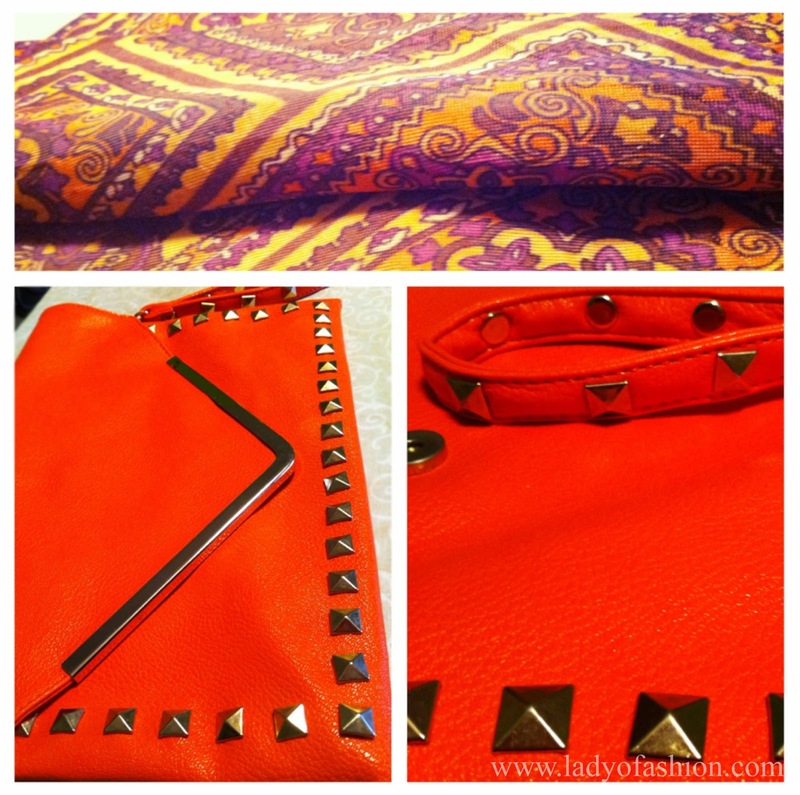 Love the bright color combination and the fun studding on your clutch! Glad to hear you were able to catch up on some much needed rest and have a lovely Easter. I really love how the envelope clutch and the sacrf matched while giving a pop of color to this ensemble. Great job! Thank you! Hope you're having a great week. Oh rest is so super important and one that we take for granted these days of over packed calendars. I hope you feel nice and rested now! I love your scarf and pretty clutch! Great color combination! The clutch and the boots are fantastic and I've seeing and love, love Life of Pi. For me it was one of the my all times favorite movies. Thanks Glee! Hope you are well dear! i'm loving the color accents in your outfit! Your purse is very cool, you did a great job studding it..